Welcome to Dawns Medieval Dresses. We provide access to the Dawns Medieval Dresses website (the "website") and sell our products to you subject to the conditions set out on this page. Please read these conditions carefully before using the Dawns Medieval Dresses website. By using the Dawns Medieval Dresses website, you signify your agreement to be bound by these conditions. In addition, when you use any current or future Dawns Medieval Dresses service, you will also be subject to the guidelines and conditions applicable to that service. Dawns Medieval Dresses reserves the right to inform the consumer that products requested are currently not in stock or otherwise unavailable. Dawns Medieval Dresses reserves the right to not ship any items that may cost more than the stated price on the website, in this event the consumer will be notified. Dawns Medieval Dresses reserves the right to refuse access to the website, terminate accounts, remove or edit content, or cancel orders at our discretion. If we cancel an order, it will be without charge to you. 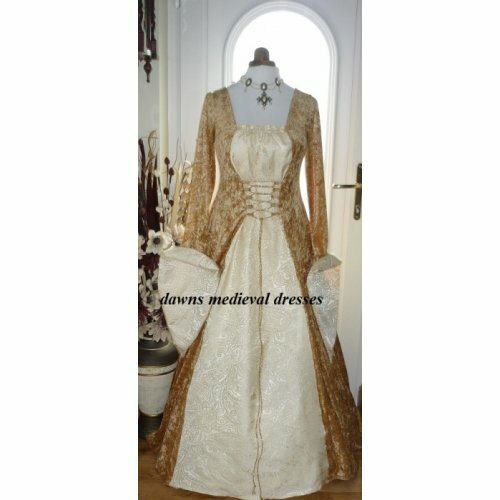 Dawns Medieval Dresses take your protection very seriously which is why we use PayPal for your payment protection. PayPal use maximum strength encrypted technology supported by the consumer's browser using a Secure Socket Layer in all of their communication with you, ensuring maximum safety when paying online through Dawns Medieval Dresses. Occasionally, we may also use the information we collect to notify you about important changes to our Web site, new services and special offers we think you will find valuable. 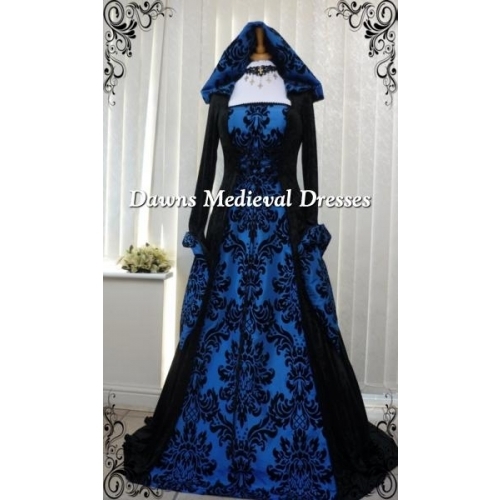 As our customer, you will be given the opportunity to notify us of your desire not to receive these offers by sending us an email request at enquiries@dawnsmedievaldresses.co.uk. Dawns Medieval Dresses grants you a limited licence to access and make personal use of this website, but not to download (other than page caching) or modify it, or any portion of it, except with express written consent of Dawns Medieval Dresses. This licence does not include any resale or commercial use of this website or its contents; any collection and use of any product listings, descriptions, or prices; any derivative use of this website or its contents; any downloading or copying of account information for the benefit of another merchant; or any use of data mining, robots, or similar data gathering and extraction tools. You may not frame or use framing techniques to enclose any trademark, logo, or other proprietary information (including images, text, page layout, or form) of Dawns Medieval Dresses without express written consent. You may not use any meta tags or any other "hidden text" utilising Dawns Medieval Dresses's names or trademarks without the express written consent of Dawns Medieval Dresses. Any unauthorised use terminates the permission or licence granted by Dawns Medieval Dresses. You are granted a limited, revocable, and non-exclusive right to create a hyperlink to the Welcome page of Dawns Medieval Dresses as long as the link does not portray Dawns Medieval Dresses or its products or services in a false, misleading, derogatory, or otherwise offensive matter. You may not use any Dawns Medieval Dresses logo or other proprietary graphic or trademark as part of the link without our express written consent. You understand that you, and not Dawns Medieval Dresses, are responsible for all electronic communications and content sent from your computer to us and you must use the website for lawful purposes only. All content included on the website, such as text, graphics, logos, button icons, images, audio clips, digital downloads, data compilations, and software, is the property of Dawns Medieval Dresses or its content suppliers and is protected by United Kingdom and international copyright and database right laws. The compilation of all content on this website is the exclusive property of Dawns Medieval Dresses and is protected by United Kingdom and international copyright and database right laws. All software used on this website is the property of Dawns Medieval Dresses, or our software suppliers and is protected by United Kingdom and international copyright laws. You may not systematically extract and/or re-utilise parts of the contents of the website without Dawns Medieval Dresses's express written consent. In particular, you may not utilise any data mining, robots, or similar data gathering and extraction tools to extract (whether once or many times) for re-utilisation of any substantial parts of this website, without Dawns Medieval Dresses's express written consent. You also may not create and/or publish your own database that features substantial (e.g. our prices and product listings) parts of this website without Dawns Medieval Dresses's express written consent. Dawns Medieval Dresses respects the intellectual property of others. If you believe that your work has been copied in a way that constitutes copyright infringement, please Contact Us. This section deals with conditions relating to the sale of products by Dawns Medieval Dresses to you. When you place an order to purchase a product from Dawns Medieval Dresses, you will be given an order number. Please quote this order number in all correspondence. We will do our best to fulfill your order but all orders are subject to availability. Dawns Medieval Dresses reserve the right to alter delivery charges and delivery times on the website without informing customers prior to the alterations. Dawns Medieval Dresses reserve the right to not ship any items that may cost more than the stated price on the website, in this event the consumer will be notified. If carriage companies used do not deliver your product within the requested time period please inform Dawns Medieval Dresses, in the event of unsatisfactory delivery we hope you will accept our sincere apologies and we will investigate the matter to ensure your order is delivered as soon as possible after your notification. Where dresses are requested but not ordered immediately, a small, non-refundable holding deposit will be required to ensure availability of fabric etc. for when the order is placed. When you visit Dawns Medieval Dresses or send e-mails to us, you are communicating with us electronically. We communicate with you by e-mail or by posting notices on the website. For contractual purposes, you consent to receive communications from us electronically and you agree that all agreements, notices, disclosures and other communications that we provide to you electronically satisfy any legal requirement that such communications be in writing. This condition does not affect your Statutory rights. Here at Dawns Medieval Dresses we always strive to offer excellent customer service in a friendly and helpful manner. If you have any queries on any section of the website please do not hesitate to ask via the Contact Us page on our site and we will reply as soon as possible.